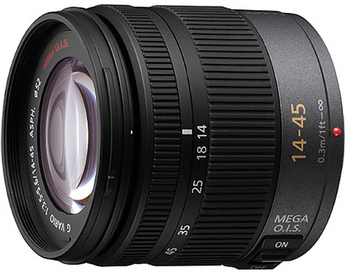 The Panasonic Lumix G Vario 14-45mm f/3.5-5.6 ASPH/MEGA O.I.S Micro Four Thirds Lens is a standard zoom lens with an equivalent range of 28-90mm, making it extremely versatile for landscapes, portraits or street photography. It also support Panasonic's contrast auto-focus system and has built-in image stabilization as well. It features a seven-blade aperture for smooth out of focus backgrounds when shot with a wide aperture as well.